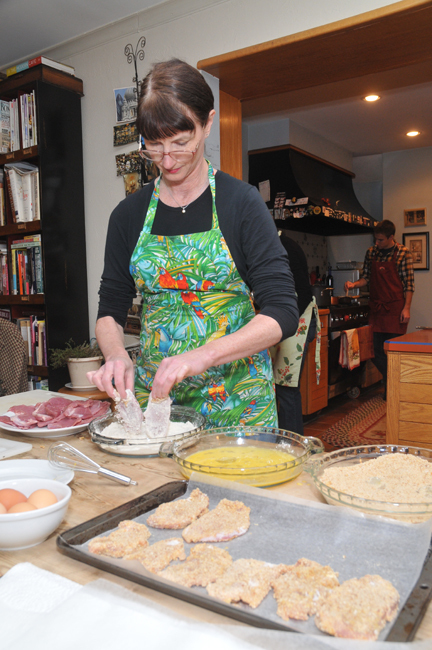 I am passionate about food and cooking from the feel of it to the smell and preparation of it. That is only the beginning! Then there is the serving of it with the right table setting and guests to join in. 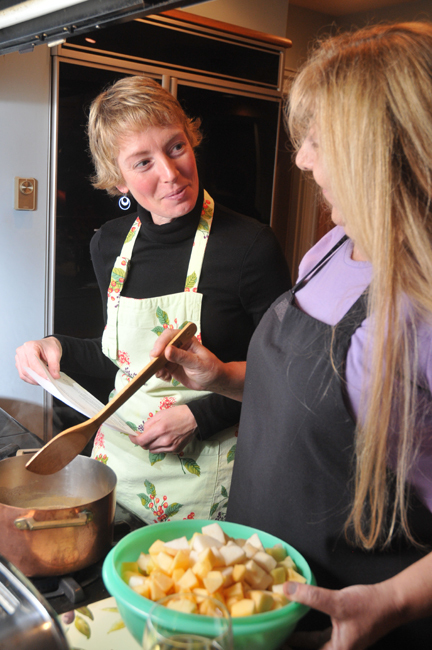 Well, after much time, a long summer gone by and the leaves falling, the holidays approaching and pressure from friends and family – I am going back to cooking classes and blogging. It is not that I ever stopped cooking mind you – I just got way behind on putting up posts with recipes. What I found is that class prep itself was a lot of work, to say nothing of managing the photos that were either taken by me or friends. Alas – I couldn’t manage it all with my full-time job. Life is a bit calmer (really?) now and I am in the mood for some blogging and certainly in the mood for more classes! 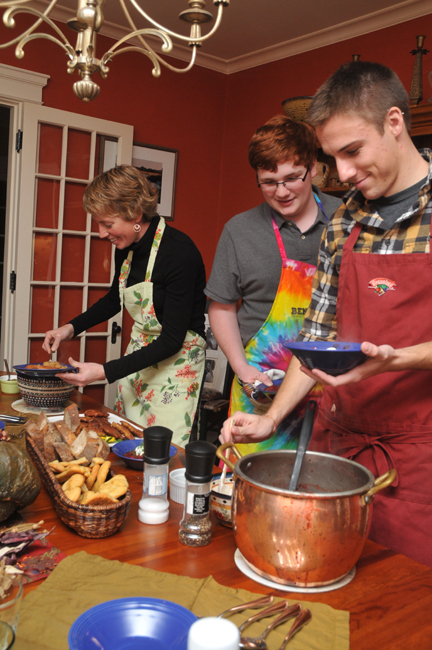 Last weekend we had a Cooking Class Reunion and what a great time it was. I prepped the meal on my own (with a lot of help from my secret sous chefs) and we feasted on Edamame Dip, Caramelized Leek and Bacon dip, Spanish Fried Almonds and some delicious cheeses to whet our appetites. Dinner consisted of Pork Loin stuffed with Fennel, accompanied by Roasted Butternut Squash Risotto, Applesauce stuffed Baby Pumpkins and a tossed green Salad with seasonal fruits added. After gorging on that spread we topped it off with Pecan Bars that would send you into a diabetic coma if over consuming and a wonderful Carrot Cake with a Lime Marscapone Icing. All in all it was a great gathering and I look forward to gathering again as a group and taking on some new food challenges together. COME JOIN US FOR THIS ADVENTURE IN THE KITCHEN! These intense little bars are great on their own or crumbled over a little bowl of gelato or ice cream. If you are using your own shortbread, make it first. Recipe follows. Preheat the oven to 325 degrees F. Baking pan required is about 9 x 14 inches. 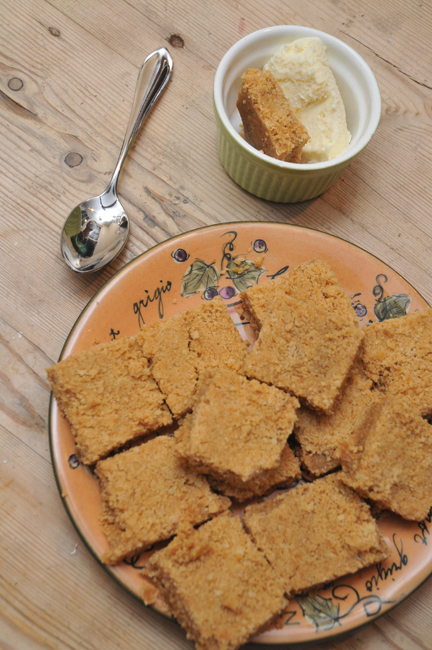 Place shortbread in food processor with the sugar and 2 T of the ground ginger. Pulse until you have crumbs. Remove about 2/3-1 cup of the crumbs and set aside. To the remaining crumbs add the chopped peel, the crystallized ginger, the additional 1 T of ground ginger, the flour and the baking powder. And pulse until well mixed. Place in a large bowl for further mixing. In the meantime melt the syrup, butter, molasses in a saucepan. When everything is melted ,mix it together with the crumb fruit mixture and mix until well combined. Press the mixture into the bottom of the pan –making even with a spatula. Place in the oven for about 10 minutes. When done, take the tray out and sprinkle the hot gingerbread with the remaining crumbs, pressing them down with spatula or spoon. Cut into squares while warm and leave to cool in the pan. Serve on its own or use to sprinkle over ice cream. This recipe dates back to England’s Lake District of 150 years ago. It also makes a great base for cheesecake! Cream butter and sugar until light and fluffy. Add the flour and semolina or cornstarch. Mix lightly until you have a smooth dough. Press the dough into the prepared pan and prick all over with a fork. Bake for about 45-50 minutes until golden. Dust with additional sugar while still warm. Cut while warm and let cool in the pan. How could you resist this? In heavy pot gently melt the butter for a minute with the orange zest and juice, sugar, nutmeg, & cloves. Stir until the butter foams then stir in the apples. Cover and for 20-25 minutes until you have a soft, lumpy sauce. Taste and add more sugar if desired. It is nice to keep the separate flavors of the sweeter and tart apples to add interest. Serve warm or set aside to cool. Johanna considers whether all the apples will fit in the stock pot. Using three plates prepare the coating for the meat. In first one place your salt, pepper and flout. In the second one put the beaten egg, in the last the breadcrumbs. Place the meat either between saran wrap to pound to ¼ inch thick. You may use the flat side of a meat tenderizer or a heavy skillet to do this. Season the meat in the flour mixtures, shaking off excess. Dip into the egg mixture, letting excess drip off. 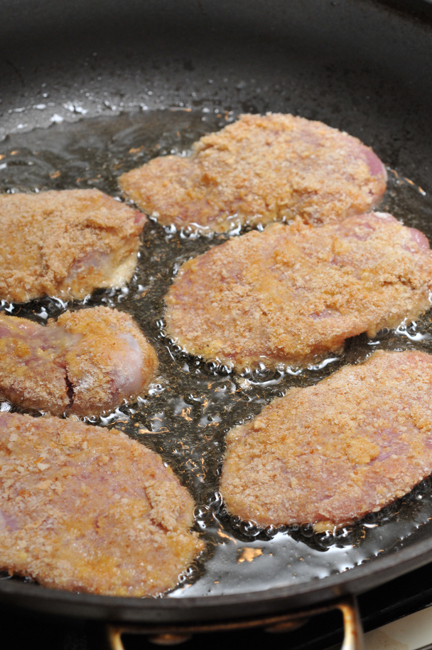 Then dredge in breadcrumbs, patting them on firmly and gently shaking off excess. Karen patiently prepares the meat - pounding, dredging, dipping, rolling. Have a warm oven ready if you are cooking for a larger group. In a heavy skillet, heat the olive over medium-high heat. Put the meat into the pan and agitate it to get the olive oil up over the sides and turn over after about 2 minutes. Brown until both sides are crisp and golden. Remove to a pan lined with paper towels to drain. Season again lightly with salt and pepper. Make certain to let these get nice and crispy! To serve put a little pile of cornichon on top and some watercress. Add a spoonful of applesauce and drizzle meat with a quick squeeze of lemon juice and bit of olive oil. Everyone is so hungry - they forget to take off their aprons! 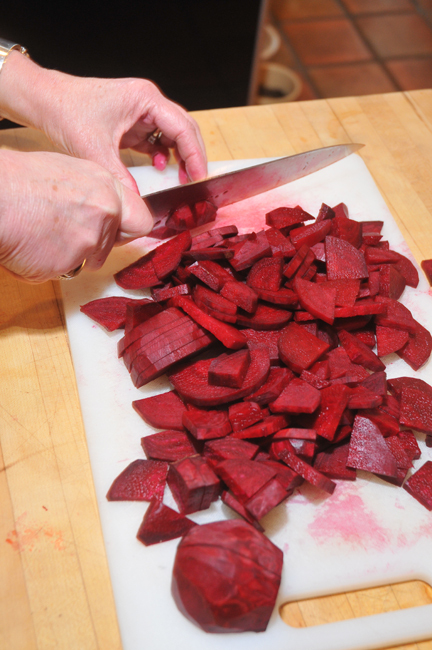 Borscht is a soup made primarily from beets. It originates in eastern Europe, probably Lithuania, and as many recipes may be found for this as there are regions of eastern Europe. It dates back to Medieval times and was primarily a food of the poor. Beets were cheap! But this is a delicious and hearty soup. It must be served with a good sour cream add the fresh dill is a must. We served it with hearty rye wheat bread from the local bakery and some beer pretzel sticks. It is one of those dishes that is even better the next day, as the flavors meld together. A hearty winter soup that takes some chopping, but is so worth the effort! 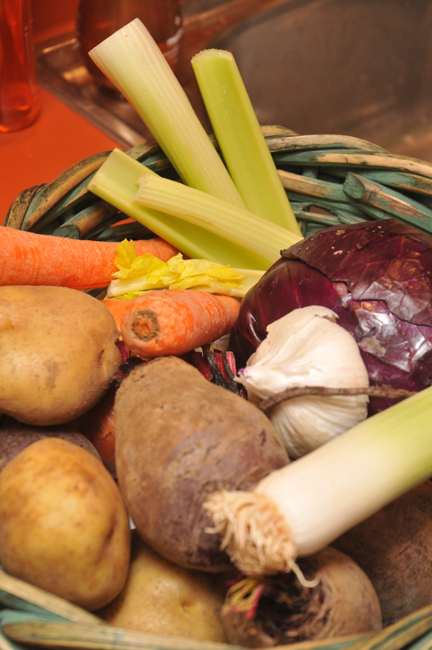 Place potatoes and beets in large pot over high heat, covered with the stock and boil until vegetables are tender. 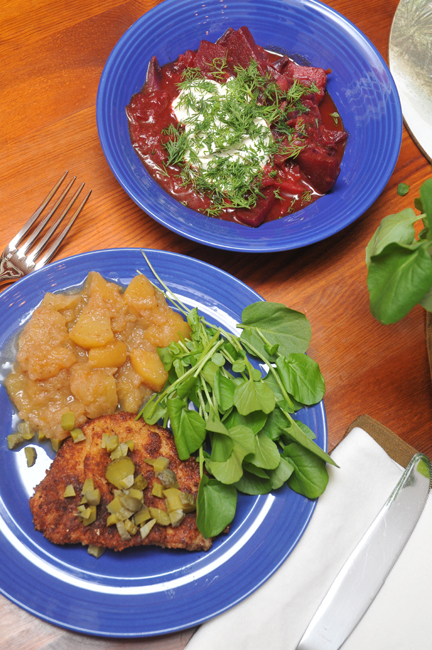 Remove the potatoes and beets with a spoon and reserve stock. Melt the butter and olive oil in stock pot and stir in the onions, garlic and caraway seeds and salt and cook until translucent. Then stir in the celery, leeks, carrots and cabbage. Mix in the stock. Cook, covered until all the vegetables are cooked and tender – about 10-20 minutes. Add the potatoes and the beets. Season with salt and pepper and a bit of fresh dill weed. Stir in the apple cider vinegar, honey and tomato puree. Simmer, covered for about another 20-30 minutes. Serve topped with sour cream and a sprinkle of fresh snipped dill. 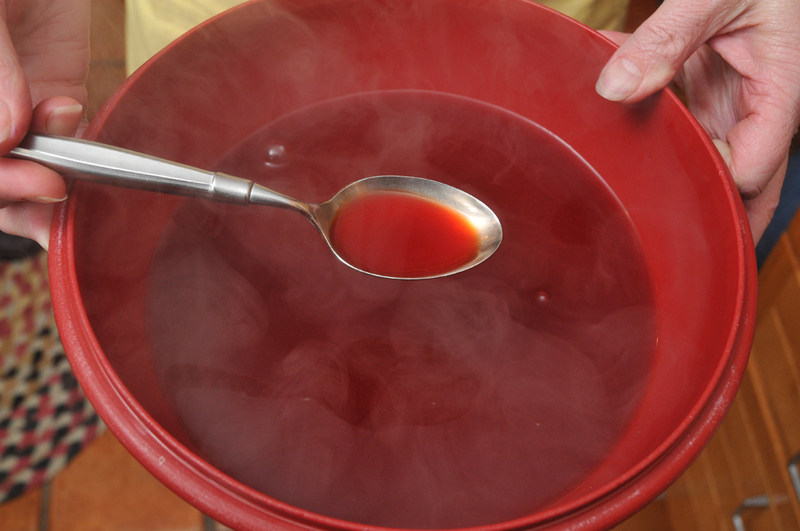 Look at the ruby color of this fabulous broth. Chop, chop, chop. Red fingers to boot! Tammy pours the warm honey brown butter over this creamy Spanish Manchego wedge. Yum! Melt Butter in small saute pan and cook until it is golden brown. Drizzle in the honey and stir to incorporate. Let cook together until rich and brown. 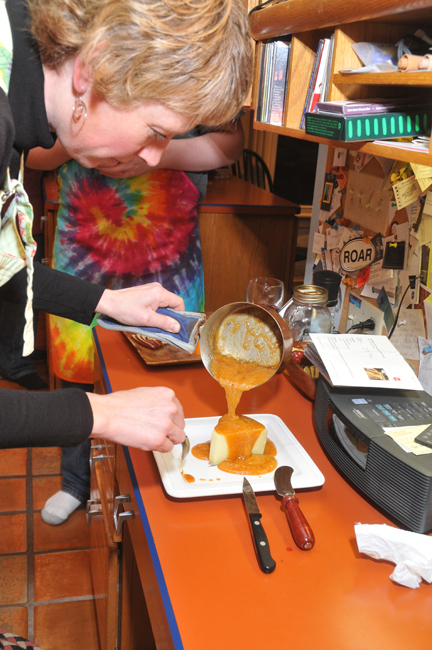 Place cheese on a platter big enough for the cheese wedge to swim in the sauce. 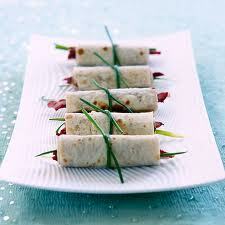 Sprinkle with salt and serve warm with crackers or thinly sliced baguette. 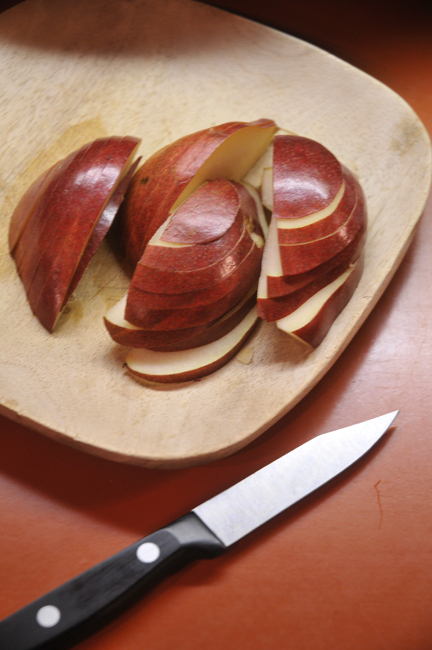 We also slice up some red Asian pears – it was delicious! You could also serve this as a cheese dessert. You won’t believe how fast this disappears!